Valerie Braden, a native of Indiana, was previously employed by a Holiday Inn Convention Center in Florida, the Stone Hearth Restaurant, and the Station Restaurant before working for the Durbin & Greenbrier Valley Railroad. She was “college-educated for the accounting side of business,” she claims, and “graduated from the School of Hard Knocks” in the food service business. The Railyard Restaurant, located at 210 Depot Street, offers catering, lunch, and dinner “in a unique spot with balcony-seating overlooking the town square. Much of our menu is home- made,” Braden said. “We are not a chain restaurant. We serve all dinners with salad, dinner rolls and two sides. We are reasonably priced and all meals are large in portion,” she said. 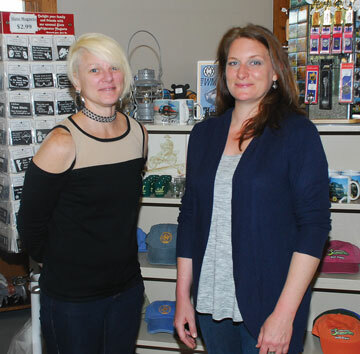 The Rail & Trail Store is one of a chain of souvenir shops located in Elkins, Durbin, and Cass, West Virginia, which offer unique railroad gifts,” Serena Marson says. The Elkins outlet is housed in the historic train station in the downtown area and may be reached by calling (304) 636-9477 Extension 111.